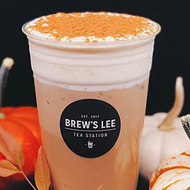 It's not just that Brew's Lee Tea Station is an Instagrammer's oasis. Sure, the café is adorable, the framed slogans are picture perfect, and any shot of their tea will definitely get you those double taps. But the tea is actually delicious. Brewed fresh every day by owners and college sweethearts Billy and Frances Lee, Brew's Lee Tea packs in a delicious punch whether it's in their rose milk teas, hot ginger turmeric teas or specialty teas such as the iridescent glowing tea or the cerulean honey galaxy tea, made to order and customizable for all palates and appetites. The tastiness doesn't stop there as Brew's Lee is also dabbling in Taiyaki, fish-shaped pastries filled with red bean or ube coconut custard.